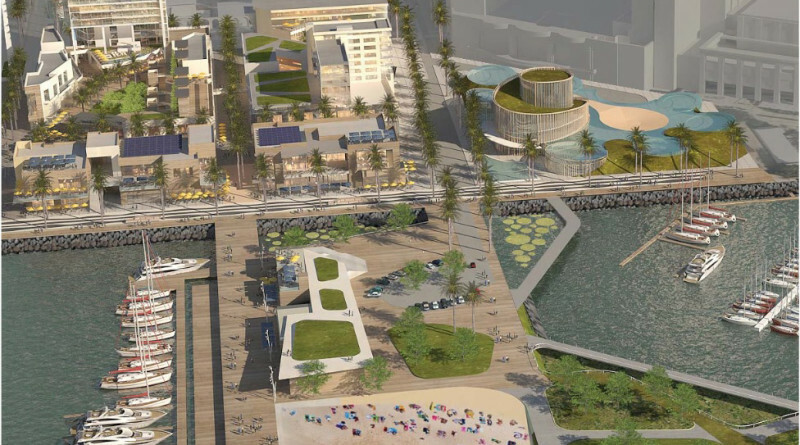 Seaport is one of six proposed projects for the San Diego waterfront that will be reviewed by the Port of San Diego’s Board of Port Commissioners in July. SAN DIEGO — In its hopes to be a world-class destination the Port of San Diego released proposals from six development teams promising to revitalize the city’s waterfront as a place for locals and tourists to boat, dine, lodge, recreate, stroll or be entertained. Port officials held an open house June 13-14 for the public to review proposals. Each team’s proposal outlined lofty ideals and made promising language of how their respective projects would harmoniously balance maritime, recreational, commercial, retail, environmental and entertainment interests in a multi-use development while also re-defining San Diego as an international city a destination similar to Los Angeles, Sydney, San Francisco or other major coastal metropolitan areas. All six proposals addressed the various criteria requested by port officials, such as developing a project consistent with the Public Trust Doctrine, providing visitors with hospitality and dining options, ensuring structures are iconic and uniquely designed, and offering spaces for ecological learning. Proposals also included plans to accommodate boaters. Open spaces and a cultural arts center were also proposed. The Port of San Diego’s Board of Port Commissioners will vet each plan out in July. Once a vendor is selected details of the project’s timeline, changes and budgetary requirements will become clearer. Below is an overview of each proposal. A collaborative team of Protea Waterfront Development, RCI, Thrill Corp., OdySea and AECOM specifically seeks to create an area – Seaport San Diego – where the public could access the city’s waterfront without spending too much money. “Ultimately it is the public realm that will create the excitement and value for the commercial uses which are woven into a carefully planned urban fabric of streets, paseos, courtyards, plazas, and, of course, the waterfront esplanade and a new Ruocco Park. Seaport creates a varied, vibrant public realm of open space and destinations,” the development team’s proposal stated. The project would feature an aquarium, hotel, restaurants, a public market, shopping, and parks with views of San Diego Bay. The proposal also incorporates boating and maritime elements, including a 164-slip marina with 10,670 linear feet of dockage. “The 30 acres of water at Seaport will bring significant ‘added value’ with improved facilities for the fishing fleet, new and improved marina slips, the addition of state-of-the-art megayacht berthing facilities, and dock and dine public piers. Waterborne transit with an expanded ferry service and water taxis will become part of the backbone for our mobility plan,” the development team stated in its proposal. Plans also call for tidal pools, oyster beds and a public swimming venue. Though similar in name to Seaport San Diego the SeaPort Development by DJM Capital Partners and McWhinney would bring three hotels and 1,000 rooms to the downtown San Diego waterfront as well as public spaces and retail. The plan incorporates dock and dining, floating dock walkways, floating slips for vessels, a seafood public market, 25,000 square feet of space for a music and cultural performance venue, creative office space, recreational marina, a variety of culinary interests and sustainability elements. Great Western Pacific and Santa Monica Seafood Co. plans to develop 3 acres of land where Chesapeake Fish currently operates. “The new building and facility we are proposing would be themed around the Tuna Harbor commercial fishing industry history and this new facility would be promoted as the ‘Tuna Harbor Pavilion,’” Great Western Pacific President Hal Griffith stated in a proposal letter to port officials. Tuna Harbor Pavilion would add a new dock for large fishing boats and a public viewing area, build a pier with a Ferris Wheel, and develop a commercial-retail space with bakeries, casual dining, a food court, restaurants and other amenities. Plans did not include any amenities or activities for boaters, kayakers, standup paddleboard users or any other marine uses. A group headed by Manchester Financial Group proposed to develop the Embarcadero area with public access and an enhanced maritime experience. OliverMcMillan proposed to develop Embarcadero District with AEG, Evans Hotels, Scripps Institution of Oceanography, San Diego Symphony and others. The developer would bring a marina with 50 to 100 slips, tide pools and environmental learning center, blue tech creative space, a dining marketplace, retail, open spaces and water access, 15,000 to 18,000 seats at an events and entertainment pavilion, and 1,700 hotel rooms to the waterfront. Perhaps the most unique proposal presented to port officials is Ripley’s plan for a public aquarium. Ripley’s proposes to build an aquarium resembling similar projects built and financed across the United States and Canada but highlight waterfront themes unique to San Diego. “While Ripley’s is not proposing a use [that] will make up the entirety of the site, Ripley’s believes that the aquarium is easily compatible with virtually any other use … the district may select for the remainder of the site,” the proposal stated. The aquarium would feature four major display tanks and several smaller marine exhibitions. A 750,000-gallon tank featuring sharks co-existing with as many as 100 different but compatible species would be the flagship display. The tank includes an acrylic tunnel with a moving glide path. Kudos to four of the developers (both Seaports, Celebration, and Embarcadero) who included facilities for boaters to access downtown. San Diego has an embarrassing lack of access to downtown for boaters, and all four of these projects would help to change that!